With the plethora of sports enhancing food items available, how does one know what to choose? Student athletes often use performance enhancing food products and often don’t know what they are really eating. This lesson helps students think critically about what performance enhancing products contain and their true nutritional value. 9.3.6 Critique the selection of foods to promote a healthy lifestyle. Pass around a bag of energy bars, hydration gels, and electrolyte drinks and ask each student to pick one but not open it. Ask students to identify why they chose what they chose (packaging, nutrition claims, preference, used before, etc.) Ask students what each product claims to do. Ask students if the products actually work in their experience. 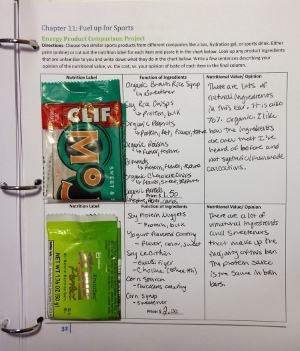 Make your own energy bars or electrolyte drink as a class or assign it for extra credit. See the links below for recipes. ← Breakfast: The Most Important Meal of the Day!